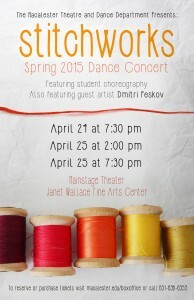 St. Paul, Minn. (April 7, 2015) — The Macalester College Theatre and Dance Department presents Stitchworks, the Spring 2015 Dance Concert, featuring original choreographic works by students and guest artist Dmitri Peskov. Performances are April 24 and 25 at 7:30 p.m. and April 25 at 2:00 p.m. in the Janet Wallace Fine Arts Center, Main Stage Theater, 1600 Grand Ave., St. Paul, Minn.
Stitchworks is also comprised of 10 new student choreographed works, including four solos, with themes ranging from conflict and abandonment, to unification and personal strength. Student choreographers include Cassidy Foust ’15 (Oconomowoc, Wis.), Kyoko Sakai ‘16 (Tokyo, Japan), Colleen Cilwick ‘17 (Ogden, Utah), Peace Madimutsa ‘17 (Harare, Zimbabwe), Ian Luebbers ‘17 (Downingtown, Penn. ), Judy Syrkin-Nikolau ‘15 (Ames, Iowa), Molly Stark-Ragsdale ‘17 (Missoula, Mont. ), and Catriona Leckie ‘17 (Pelham, N.Y.). Senior soloists include Hector Santiago Bautista Aniceto ‘15 (Veracruz, Ver., Mexico), Katie Rank ‘15 (St. Louis, Mo. ), Hana Sato ‘15 (Minneapolis, Minn.), and Laurel Thompson ‘15 (Northfield, Minn.). For ticket information, go online to macalester.edu/boxoffice or call 651-696-6359.